After a quick peek through my recent photo archives, I realized I've been shooting pictures of rubbery things with alarming frequency. I didn't set out to do so, but perhaps the realities of a Canadian winter have become an unintentional influence on my photographic preferences. So for the next week, we're looking at rubber, and I thought we'd start with this delightfully bright display of new boots at the local - you guessed it - grocery store. Pink or purple boots may never find their way onto my hideous feet, but that doesn't mean I can't appreciate the display for what it is. Or smile as I walk past. Your turn: Take a pic that suggests or evokes this week's theme, rubbery, and post it to your blog or website. Alternatively, find a pic you've already taken and/or posted. Leave a comment here letting folks know where to find it. Visit other participants to spread the photographic joy. And pop back again through the week to add additional pics as they occur to you. Head here for more background on how Thematic works. And please accept my thanks for making this little weekly photo-exploration exercise of ours such a joy. No boots but some interesting games. I have boots and photos! 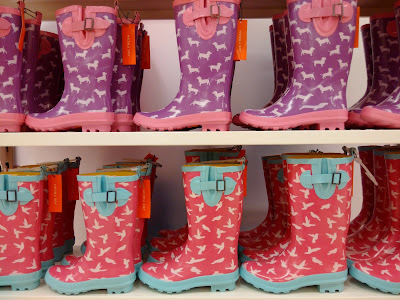 I want gumboots like the ones in this picture! They do look pretty all stood in rows like that.